This page identifies the Roles and Responsibilities in the Club and the Team Members involved. The Committee Members are highlighted in bold. The Structure of the Club is outlined below with key Roles and Responsibilities. 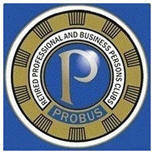 Contact with other Probus Clubs. In the absence of the President, the Vice President shall be responsible for the Meetings. Presenting the Accounts to the Auditor. Managing and Updating the Probus Website including new data, archived data. Planning of and Arranging the Annual Quiz Evenings. Identifying Alternative Locations with Criteria, as required. The President, Vice President and Immediate Past President shall be responsible for one of these teams or a Sub Activity within a team. Contacting Attendees with any Charges and Meeting Locations.